The most widely used flare pilot ignition system is the compressed air flame front generator. The popularity of this system generally is due to the historical fact that these systems were the first to be developed and remained as the only “reliable” ignition system until the 1980s. With this system compressed air (generally instrument or plant air) and fuel gas are metered through control valves into a mixing chamber located at grade. Downstream of the mixing chamber there is a sparking device to initiate the flame front (fire ball). 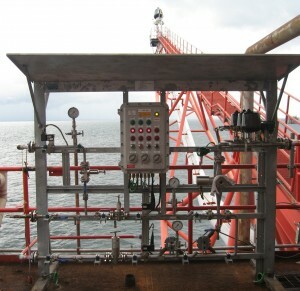 During operation the flow of fuel gas is established through the system and the flame front line is first purged, and then filled with the gas / air mix. The mix in the combustion chamber is ignited and the flame front initiated. The flame front ‘fire ball’ travels to the pilot tip where it ignites the pilot. The great advantage of the compressed air flame front generator is that the flow controls and the sparking device are at grade and can be serviced while the flare is in operation. Systems can be fully automated or manual. The principal disadvantage of the flame front generator is it is more difficult to operate than an electronic type. However with basic operator training and a good manual there shouldn’t be any cause for concern. The only real ‘trick’ is the balancing of the gas / air mix for the ignition line which must be adjusted as gas composition varies. A solution to this is to use a consistent bottled gas source such as propane when igniting the pilots. Instead of the use of a compressed air supply, it is possible to use the fuel gas pressure to inspirate the combustion air requirement to create the required air fuel mix in the combustion chamber. The obvious advantage is that compressed air is not required. The disadvantage is that self-inspirated devices generate only limited pressure. Consequently they can only be applied to limited distances and piping configurations. This system is very rarely found on elevated flares and is not preferred.